(Newser) – It was bad enough when reports emerged that poachers had killed about 40 elephants in a Zimbabwe national park by poisoning their watering holes. But now the death toll is 91 and still rising. Massive bones, some already bleached by the blistering sun in the Hwange National Park, litter the landscape around one remote watering hole where 18 carcasses were found. Officials say cyanide used in gold mining was spread by poachers over flat "salt pans," also known as natural, mineral-rich salt licks. 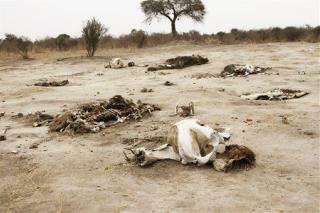 They say lions, hyenas, and vultures have died from feeding on contaminated carcasses or drinking nearby. Hopefully, in Zimbabwe they will just shoot the poachers if they catch them. In the U.S. we would probably make them citizens first to allow them the best possible outcome in a trial. I am so sickened to hear what happened to these smart and majestic creatures. I hope there is some effective way of curtailing the killing of these great animals.